Flies on the food and cockroaches on the cutlery. Employees of Rhodes’ food service provider, Aramark, have shared claims of health code violations, as well as personal stories of what they described as “workplace hostility.” Employees spoke to The Sou’wester on the condition of anonymity—fearing that speaking with the press could endanger their jobs. Despite this concern, some employees gave permission for their personal experiences to be published. Aramark has emphasized its commitment to serving quality food and has already begun implementing a number of changes to ensure the college’s and the company’s own standards are met. At the college’s direction, Aramark has dispatched two senior-level managers to assist with quality control. Aramark has also assigned a new general manager to head dining services. “I have personally seen roaches crawling on clean spoons and forks and knives. I didn’t think to take a picture of it, but I have seen it with my own eyes,” the employee said. 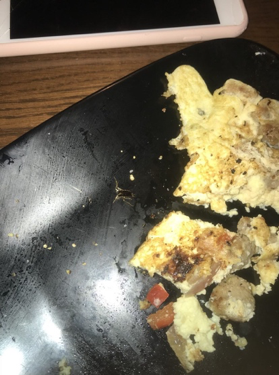 A small cockroach found in Grace Lemons omelet. 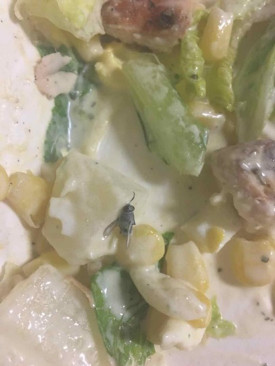 A fly found in Nuanqui Hou’s salad. If she had the choice, Hou said she would never eat at the Rat again. 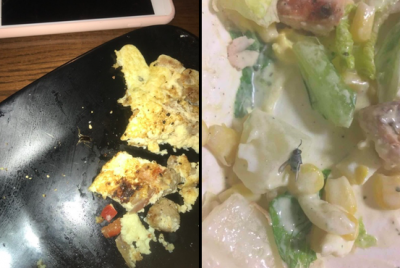 Both cockroaches and flies in the kitchen constitute violations of the Shelby County health code. According to Shelby County’s Environmental Health and Food Safety Administrator Kasia Smith-Alexander, the infraction falls under Violation 6-501.111 Controlling Pests. Other allegations of health code violations centered more around human error. Specifically, the employees’ allegations were directed at management staff more than anyone else. The employee even shared a specific incident when a manager ate food from the line without any proper food preparation gear. Food being prepared without gloves, food being prepared without hats or hair nets and food being eaten as it is prepared are all Shelby County health code violations. According to Smith-Alexander, the infractions fall under,respectively: Violation 3-304.15 Gloves, Use Limitation; Violation 2-402.11 Effectiveness/Hair Restraints; and Violation 2-401.11 Hygienic Practices. All three employees said they do not eat from the Rat themselves—excluding food they watch being prepared—and still would not eat there even if the food were free. RealRhodesDining has uploaded 18 submissions of unappetizing food. According to Ashley Mullarkey, all submissions are from members of the Rhodes community. Mullarkey wants food to be a positive talking point at Rhodes, unlike the general student consensus surrounding it now. “I wish for the quality and flavor of the food to be important and taken into consideration for all meals. Students should be able to enjoy their time at the dining hall and have access to good food,” Mullarkey said. Aramark responded to the alleged health code violations and the photos pulled from “RealRhodesDinining” by underlining their commitment to health and by announcing a plan of action to ensure food quality meets both the college’s and their own expectations. “We work closely with the College and the Health Department to ensure that the food served at Rhodes is of the highest quality and prepared within the safest environment. Any issues found during routine health inspections are addressed and corrected quickly. We consistently receive high scores on our health inspections. The most recent inspection by the Shelby County Health Department, conducted October 24, resulted in a rating of 96/100. The points deducted were non-critical in nature and corrected on-site and did not relate to any foods prepared as part of the allergen program. Our food safety processes and procedures are industry leading. We maintain rigid standard operating procedures for the entire flow of food production. This includes providing an environment that protects the safety and integrity of food from its delivery, throughout its storage, preparation, transport, and ultimately, to the point of service to the customer. Our food service staff is also engaged in a learning environment that includes a food safety orientation before associates start work, ongoing manager and associate food safety training, and job-specific training to continually reinforce safe practices. When presented with photos pulled from “RealRhodesDining,” Cutler provided a second statement, which outlined a number of changes and increased quality assurance methods Aramark plans to or has already implemented. “Nothing is more important to Rhodes Dining Services/Aramark than food safety and the customer experience we deliver. We take all student and customer concerns about food quality very seriously and were shocked by the images that we saw for the first time on social media this week. Rhodes Dining Services/Aramark was not contacted directly regarding this issue, and we are unable to determine the exact time/location of service based on the social media posts. However, as soon as we became aware of these concerns, we took immediate action to put a plan in place to ensure we are delivering the quality and service we promised and students deserve. Additionally, we are bringing in Aramark’s corporate leadership and health and safety experts to conduct a complete review of our operation and the dining facility to ensure that any questions or concerns are properly addressed. In addition to unannounced frequent health inspections by the Shelby County Health Department, Aramark also conducts regular internal inspections and takes the added step of engaging independent third-party auditors to objectively evaluate our practices and ensure the utmost safety in our operations. The most recent health inspection by the Shelby County Health Department was conducted on October 24, 2018, in which we received scores of 96 and 97 out of 100. Further, our inspection score has been 90 or above for8consecutive years. We are very proud to serve the Rhodes community and take full responsibility for any food quality or service issues. While none of the issues were reported to anyone with Aramark or Rhodes Dining Services, we agree that they are concerning and contrary to everything we stand for as a food company who has been in business for over 80 years.We encourage anyone with a concern about their dining experience to contact any of our Managers on Duty in the dining location, or one of our associates, so that we can provide immediate attention to any concerns, comments or suggestions on the spot. You may also contact the dining office at 901-843-3541 or send feedback through the dining website, or Your Voice Counts web portal which has instructions posted at various locations in each of our dining sites. However, Aramark’s claim that “none of the issues were reported to anyone with Aramark or Rhodes Dining Services” is contrary to Lemons’ statement that she approached the supervisor on duty about the cockroach in her meal. Lemons, it would seem, was also contacted by the third-party auditor mentioned within the statement. At the time of her interview with The Sou’wester, Lemons had not spoken to the auditor about the incident. All three employees interviewed said the managerial staff make their work environment hostile. Additionally, the employees drew a causal link between their claims of workplace discomfort and the quality of the food. 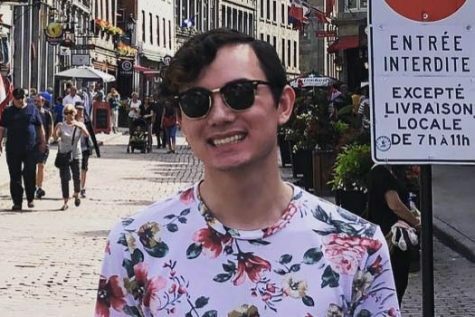 Black Student Association President Jamarr McCain ’19, who has been openly critical of Aramark’s treatment of its employees, released a statement to The Sou’wester. McCain’s statement also drew a link between employee treatment and food quality. “On another note, I firmly believe the quality of Aramark’s food is connected to the mistreatment of Aramark’s employees. If your being mistreated at your job by management and customers, then it is plausible your work ethic and passion may dwindle. So, when I walk into the Rat and see the same food presented in slightly different ways each week, I am far from surprised. What does surprise me is the amount of Rhodes students that will cry and complain about the food but fail to ask the necessary question that will lead them to an even bigger issue: why is the food this bad? I can assure you that the unseasoned, bland recipes are not the only culprits. If you wonder why the people serving your food don’t look happy when serving you, then ask why are they unhappy. Do you see my point here? Aramark emphasized they have not received any complaints regarding a hostile work environment. “I can assure you that we take all concerns raised by students, customers, guests and employees very seriously. For employees, we provide many channels to bring any concerns to our attention. These include direct communication with their supervisors and managers, talking to their HR manager, and a 24-hour toll-free hotline (managed by an independent third-party) where they can choose to remain anonymous. Aramark’s statement also asserted that it does not tolerate harassment and underlined its status as a well-respected company by notable advocacy organizations. “We do not tolerate bias, harassment or discrimination of any kind. In fact, we pride ourselves on championing diversity and inclusion, and the proud history of achievements we are building doing so. One of DiversityInc’s ‘Top 50 Companies for Diversity,’ the annual survey tracking the nations’ top companies in terms of hiring, retaining and promoting women, minorities, people with disabilities, LGBTQ and veterans. DiversityInc’s survey is recognized as the most rigorous, data-driven rating of its kind in the country. A ‘Best Place to Work for Disability Inclusion’ by the Disability Equality Index with a 100% top-score. 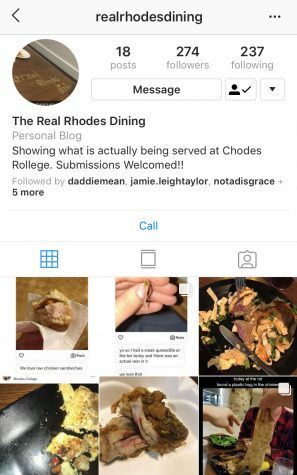 President Marjorie Hass released a statement to the college community following the widespread distribution of the RealRhodesDining Instagram page on Friday, Nov. 9. The Sou’wester had also contacted the college for a statement on this story prior to the message’s release. Hass expressed both concern and dissatisfaction and outlined the college’s plan of action to improve the quality of dining services. Additionally, Hass requested the president of Aramark’s higher education division to visit campus. The college has since been informed that he will bring a team of senior executives and the company’s regional culinary director. The delegation will meet with student focus groups, employees and Hass, herself. Associate Dean of Students for Inclusion and Involvement Meredith Davis has been labeled the college’s point person for student concerns. Davis will be working closely with Aramark employees and managers to improve food quality. Dean of Students Russ Wigginton will continue to keep the college updated with the progress of both Rhodes’ and Aramark’s efforts. Regardless, Hass expressed hope in the college’s work to improve the entirety of Rhodes’ dining experience. “As a residential liberal arts college, food is an important part of our culture. We must ensure our students, faculty, and staff members have access to high-quality, satisfying, and nutritious dining options. I visited the Refectory this morning and spoke with many of our dining employees, some of whom have worked here for decades. I’m encouraged by their resolve and willingness to work together with the college to restore the confidence of our campus community in the dining program,” Hass said. I first came to our Southwestern, aka Rhodes, campus in the fall of 1971 to begin work on what was to become WLYX, Lynx Radio. Even then, the Rat, which I believed had the finest meals of any college in this nation, faced campus ridicule by what I simply believed to have been a most ungrateful assemblage of students who, before their arrival, had never had anything other than silver spoons in their mouths. Now that the spoon had become an alloy of iron with small amounts of carbon, widely used in dining facilities, otherwise known as steel, the true color of these students became manifest. It was the color of evil undisguised in full regalia. 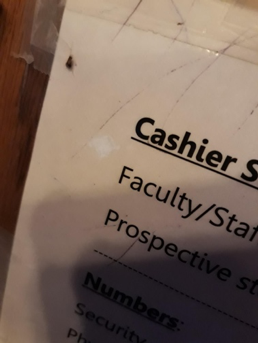 These were the same ungrateful students who complained about flies, cockroaches and mistreatment of employees while at the same time leaving the dining hall in deplorable condition, worse than any pig sty. Students who routinely urinated on the floors in the restrooms and left profane graffiti on the walls. Students who out of pure spite and with malevolent intent dumped their food in the walkways. Students who never once had the heart to honor their college or their colleagues by picking up a crumb or a napkin and properly placing it in a receptacle designed for that purpose. And this all took place fifty years ago. Just as today. Race card assaults regarding the integrity of the refectory is a “last-act-of-desperation” tactic to find resolve in the matter of this insidious maladjustment regarding the moral soundness of Aramark, it’s management, it’s employees and the relationship that the corporation sustains with our beloved institution. Again, nothing new over the last fifty years. Just as today. The same attitude, nearly pandemic throughout our beautiful campus, has reared it’s ugly head once again, like the hideous Medusa, a detestable Gorgon spewing filth, condemnation, sickness and nausea. I am not Perseus, the son of Zeus who slew Medusa with the help of Athena and Hermes. We are all Perseus and can slay Medusa together. Consider the cost to you for each meal. Approximately 4 dollars for all you care to eat. A meal which for many, including myself, is better than we could eat at home. Fortified and enriched with nutritional essentials, substances of strength and life. Be assured, there is no better value or better food at that price, and the food is exceptionally great. Rhodes has a very honorable, distinctive reputation of being the finest college in the nation dedicated to the service of our community. Why haven’t the most vocal student opponents of our food services made a good-faith effort to correct these problems in real-time by working alongside the many loyal, dedicated and wonderful employees who cater to their needs daily ? I would gladly do so without compensation as they’re part of our Rhodes family. Aramark employees are among the kindest, friendliest and most thoughtful people that I have ever known. I cherish them and their friendship. You’ll soon realize that the very few minor isolated instances of foul dining experience are seriously cockeyed and out of alignment with reality. Again, slamming the Rat is nothing new. Students who have little or no controversy affecting their privileged lives believe that creating contentious speech, nauseating imagery and incongruous juxtapositions will sell newspapers. They create contempt for their journalism and needlessly punish the honor and integrity of our college, as well as their own character. Great journalists have the power to heal by the manifestation of a prescription for joy, mirth and merriment. Your readers lives are enriched by you. Inspired by you. Your readers enjoy well-being and contentment because of you when you raise the spirits of those you write about rather than lower their dignity. It is with my deepest respect, complete and wholehearted fidelity to Rhodes College for my lifetime, that I submit my letter. With faith, love and affection for all this blessed season. The claims in this article are not, as you stated, “seriously cockeyed and out of alignment with reality.” Rather, they come from Aramark employees and students whose claims we vetted thoroughly. Additionally, the college administration and Rhodes Student Government are closely involved in bettering dining services on campus. The Sou’wester is proud to continue its 99-year continuous publishing tradition with investigative articles that display exceptional journalism. This article was published not to “sell newspapers,” (after all, they’re free) but to point out weaknesses in dining services at Rhodes. The entire college community deserves to know this kind of information. For us to withhold this information in the name of protecting the college’s image would be far more injurious to the college community. Outstanding journalism points out flaws in institutions not to “needlessly punish the honor and integrity of our college,” but to ensure their repair for posterity. This article does exactly that.